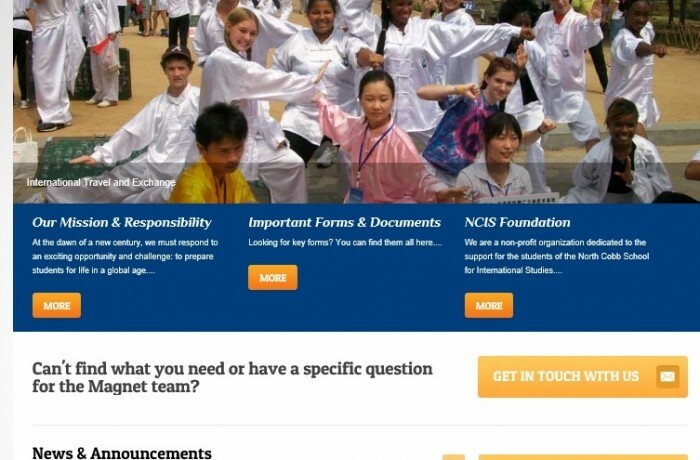 Working with the North Cobb High School for International Studies (NCHS Magnet) program, we were able to redesign their former website to provide an easier to update, responsive and mobile friendly website. The new site includes multple access methods for students and parents to get the latest news from the school, either via the website, an RSS feed or the general newsletter. Additionally since the Cobb County School District has started a BYOD Wi-Fi system inside the school, numerous students have access to their mobile devices and can check out the website from anywhere on campus. Based upon the leading WordPress platform, the Magnet program can now communicate quickly and easily from almost anywhere and the Magnet Coordinator can blog from his phone. Visit North Cobb High School for International Studies to see the site or for more information on the International Studies Magnet Program.